Brasco ///, an award winning creative branding and digital marketing agency, was a Partner Sponsor for this year’s 7th annual Innovate Raleigh Summit. The event took place at the Downtown Raleigh Convention Center on November 9th. Brasco /// supported the event planning team with social media marketing, creative support, and strategy. 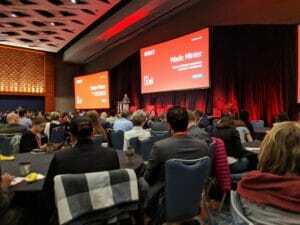 Now in its seventh year, the Innovate Raleigh Summit convenes a diverse group of entrepreneurs, business leaders, and engaged citizens from across our region. This year’s Summit highlighted inspiring stories while exploring the vision for the future of our community and creative, innovative ways to meet our challenges. Through a series of panel discussions, keynote lectures, presentations, and workshops, the Summit connects participants in a day-long dialogue about the most important elements that will contribute to our community’s success – namely the future of funding, our talent pipeline, and fostering a vibrant and inclusive community. “I remember attending the very first Innovate Raleigh events and seeing the energy and passion of people in this region to come together to make our city great. Setting goals, listening to different perspectives and ideas, and actually following through with executing on these ideas is what sets this event apart,” said Brandon Ives, Partner and CEO at Brasco ///. Brasco /// is an award-winning creative branding and marketing agency. We engage audiences to tell great stories through a fully integrated suite of marketing services. The agency is built on the concept of “Be Authentic”, a mantra that motivates our team, our clients, and our work to seek real connections and experiences. Armed with a client base in a variety of industries, Brasco /// specializes in marketing strategy, creative brand design, web development, online/SEO marketing and integrated marketing services. The company, located in the heart of downtown Raleigh, North Carolina, maintains a prestigious client base and is a one-stop shop for all aspects of design and marketing creation and management. The agency has been providing services to clients since 2007 and delivers passion, energy, creativity and experience. For more information, visit www.brasco.marketing.